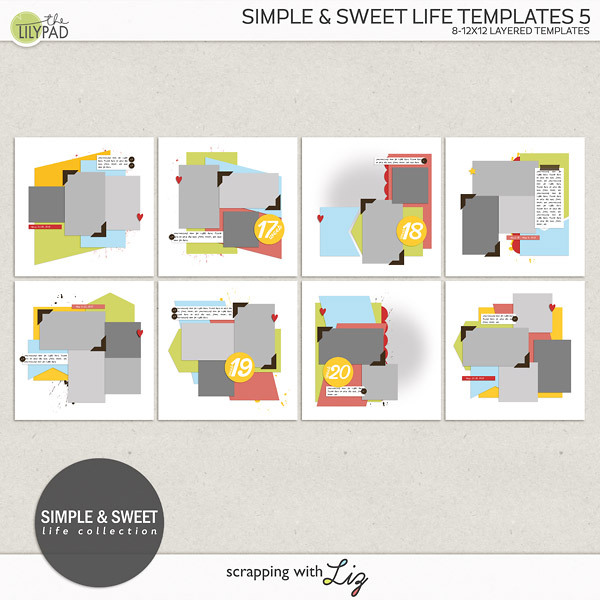 Last week I shared my 2014 Layflat Shutterfly Album. While I had my album out taking pictures of it I thought I would take pictures comparing it (mainly the size) to some other albums I've printed. I thought you guys might like to compare different sizes to see what might work for you. 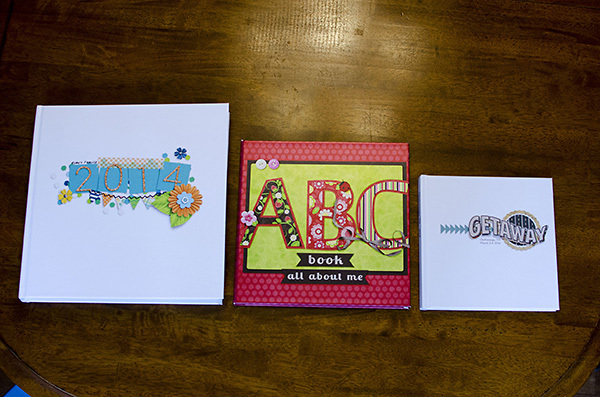 Right to Left: 12x12 Layflat Shutterfly Album, 10x10 Layflat Adormapix Album, and 8x8 Layflat Shutterfly Album. 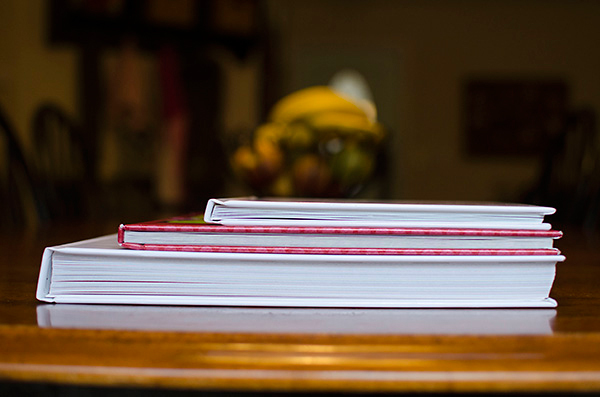 The bottom (12x12 Layflat Shutterfly Album) has 106 pages, the middle (10x10 Layflat Adoramapix Album) has 26 pages, the top (8x8 Layflat Shutterfly Album) has 20 pages. 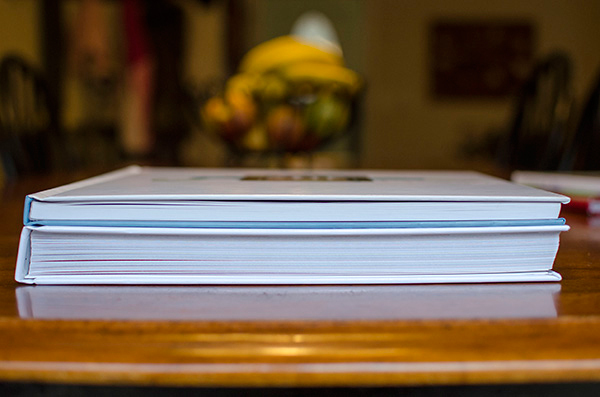 Here's comparing the thickness of my 12x12 Layflat Shutterfly Album to my 12x12 Blurb Album (not layflat). These both have about the same amount of pages. 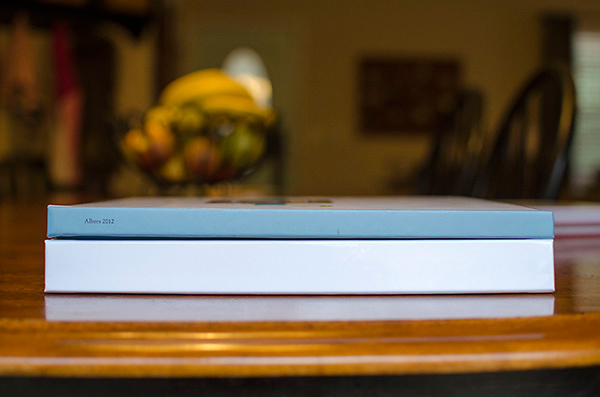 You can see how much thicker the layflat album is. Here's what they look like opened up. 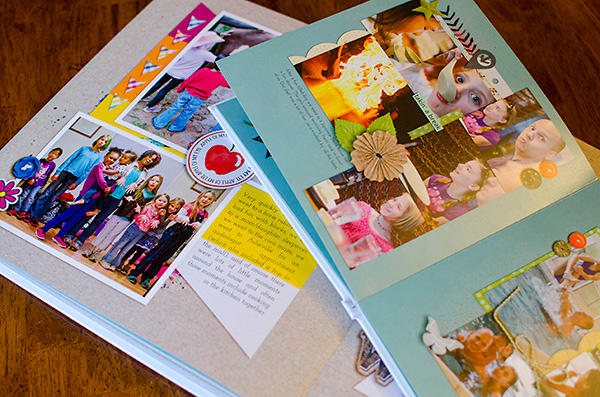 The pages of the Shutterfly Layflat Album are much thicker and more durable. 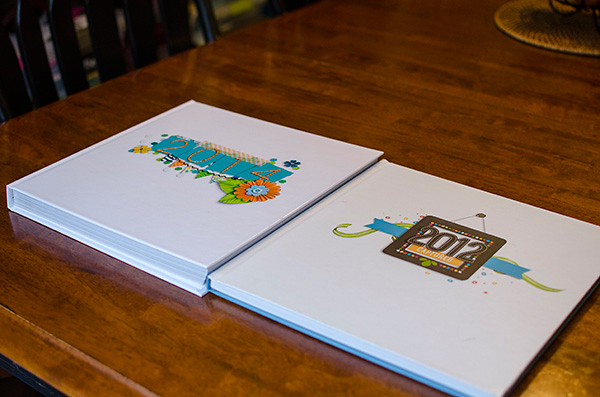 And to be honest I think the print quality of the Shutterfly Album is much better. Side by side. 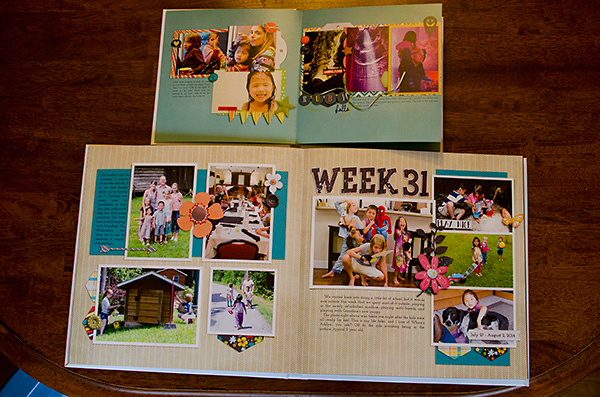 I do like the glossy, shinier look of the Shutterfly Album. The white is brighter too. 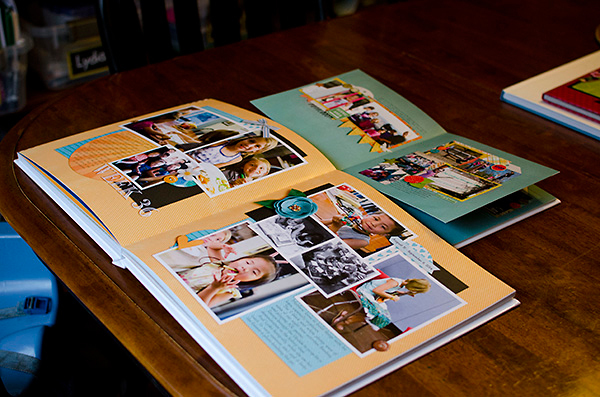 Now, here's what I was really interested in, comparing the journaling and photo size. 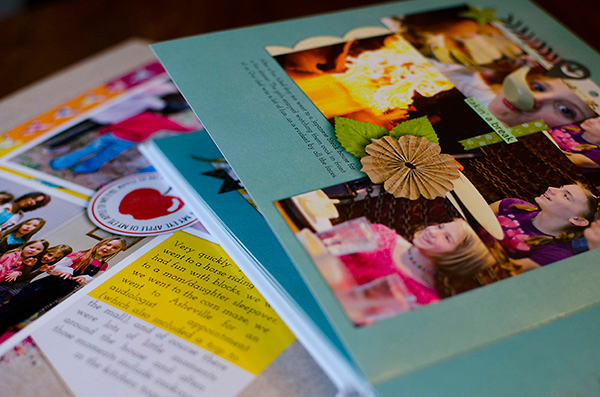 Could I have printed my 12x12 as a 10x10 or 8x8 and still have been able to read the journaling and liked the size of the photos? 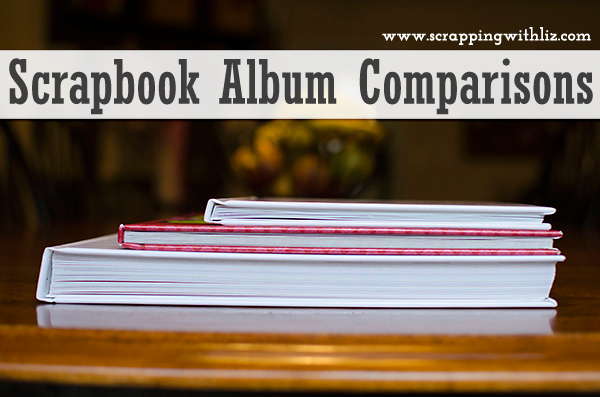 In both albums the journaling is readable. It is much smaller in the 8x8 but still readable (same font size). The photos and elements all look great in both albums. I actually think that the elements look more like a realistic size in the 8x8. Maybe I go a little big on my elements on my 12x12 pages.....I'll keep that in mind. And here's the 8x8 and 12x12 opened up next to each other. 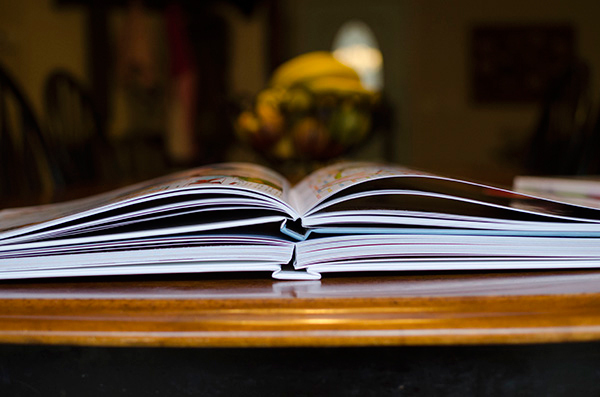 It's quite a big difference, but both look great and the journaling is readable in both. The 8x8 album is much easier to hold and look through. When we look at the 12x12 we have to lay it on the table. It's kind of difficult to sit on the couch and look at it.....but I'm okay with that because that means my kids know it's a special book that doesn't just get drug around the house to get looked at. All in all I think my 12x12 Layflat Album would have looked just fine as an 8x8 or 10x10. I think I'll still stick to the 12x12 for my yearly family albums. I'll probably go for the smaller size for gift albums or special vacation albums. Hope that helps you with any decisions you might have to make in printing your albums. 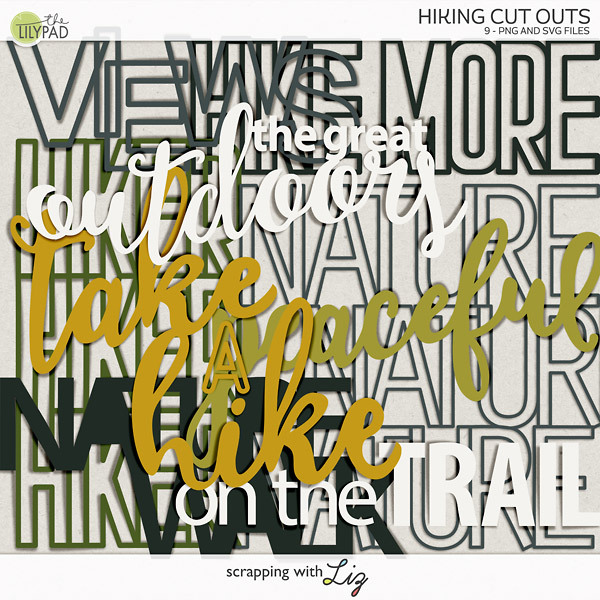 *There are affiliate links in this blog post. All opinions are my own. I've been toying with the idea of going to 10x10 albums for everything. 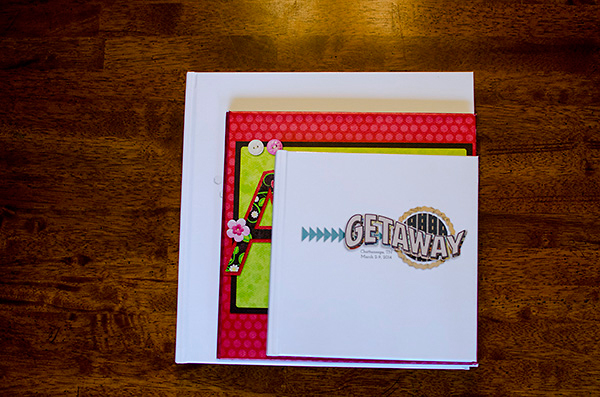 In the past, I've done 12x12 for my annual albums, and 8x8 for vacation or special occasion albums. Now that I've done a few 10x10 albums, I'm finding that I like holding that size best. It still feels big, but it's easy to browse. I'm reluctant to change, because I like seeing all of my 12x12 annual yearbooks in a row on the shelf... silly reason. I sort of feel the same way, Lori. I think the 10x10 is a really good size...but I like all of my 12x12 albums on the shelf. 2015: Week 1 is Done! When I Want to Scrap Fast! Daily Life 2014: It is Finished!